Anchoring Etiquette - The Unwritten Rules of the Rode! Anchoring Etiquette - The Unwritten ‘Rules of the Rode’! Most, though not all, laws that govern us today are based in some way on common sense and established practice. Anchoring etiquette is no exception, and though mostly unwritten, there are still things one should or must comply with when coming into an anchorage and dropping a hook. The same goes for what we do once securely attached to the bottom. Of course, now that we’re writing about them, ‘the rules of the rode’ will no longer remain unwritten, will they? Like many things in life, common sense often dictates how one should or should not behave. Combined with a strong sense of integrity, common sense also conveys a sense of what is right and what is wrong. Distinguishing between what is right and what is wrong allows us to make the next decision about what we should and should not do in relation. The combined sense of rights and wrongs as well as shoulds and should nots is what forms the basis of etiquette. When there is no written rule or law, common sense and etiquette will often dictate who is right if and when a dispute arises. And rest assured that it will. There are actually two sets of considerations in anchoring etiquette. The first helps create order, and hence safety, in the way boats align in the anchorage. The second helps maintain serenity when chaos could prevail. (1) The first boat sets the precedent. (2) Once anchored, treat others as THEY would like to be treated…with respect. 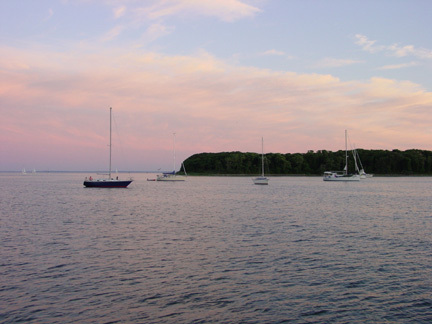 The perfect anchorage off Charles Island in CT.
Anchoring etiquette dictates that the use of an anchorage is on a first come, first served basis. Boats coming later have to respect the space needs and swing radii as well as other attributes of those already anchored. This includes, but is not limited to the obvious considerations: type of boat, method of anchoring, selection of location and behavior of the boaters. Of course, if you are the fiftieth boat in the anchorage, it’s pretty hard to tell who got there first. You can spend the whole night going from boat to boat asking, “Who was the first boat here?” or you can treat all those who were there before you as setting the precedent. Look at your chart and guestimate where the other boats are. Cruise through the anchorage before selecting your spot. 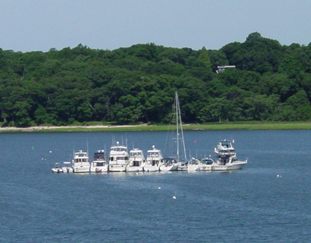 Look at how other boats have anchored. Ask for advice. Anchoring is a spectator sport, and chances are that folks keeping an eye on the anchorage at the height of activity in the evening will have their radios on to catch interesting chatter, and even to assist when necessary. We’ve had a couple of instances where we spoke to people in the know. Finding a spot to anchor is not always easy in a busy harbor. 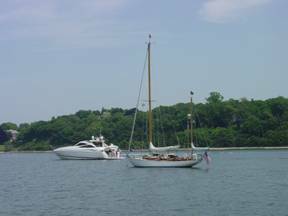 When selecting your spot, check around for proximity of anchored vessels. How close is the boat next to the spot you are eying? Might they have a generator or air conditioning onboard that would create noise in the anchorage? Does it look like a situation with party potential, such as a raft up? Do they have anchors out in configurations that would create markedly different swing patterns than you are contemplating. If the people on the boats you're positioning yourself near are glowering at you, take that as a clue to anchor elsewhere. In the end, boating etiquette is pretty simple: a matter of being a good neighbor. Keep that in mind, and you'll be welcome in any anchorage. No matter how much room there is an anchorage, someone always drops anchor near another boat. We call it the magnet effect. Because of the magnet effect, even though most boats are plastic, if you drop a hook in the water in a secluded anchorage you are bound to attract the only other boat to come in. Yep, they’ll do a nice circle around your boat, wave to you, then drop a hook right next to you  never over on the other side of the bay. How close they drop it is a matter of vital importance. Now if you were there first, it is your right to speak to them and ask them to move. Remember, if your property or your safety are at risk, you have the right and the obligation to ensure the best possible outcome. Speak up. We’ve called over, hailed on the radio and in other ways ascertained the intentions of the anchoring vessel. We have similarly negotiated in reverse with the vessel there first. Anchoring etiquette requires invocation of the Golden Rule  you know, that you treat others the way you'd like to be treated. So unless you are specifically invited to anchor next to someone, assume that you should give them as much space as possible. And unless an anchorage gets extremely crowded, don't anchor directly upwind of another boat. Besides anchoring so closely that other boats don't have swing room, other anchoring no-no's include driving too fast through anchorages, dropping the hook in the middle of channels, and tying off to channel markers to fish. 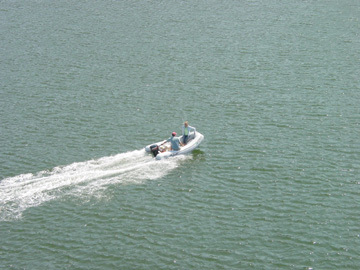 There's also a question of limiting noise pollution - after all, most boaters want to get away from it all on the water. How much scope do the other boats have out? The angle the rode makes at the surface of the water is a quick indicator of how much rode you or your neighbor has out. The more acute the angle the greater the scope. More is better. A rode pointing straight down has minimal scope. The correct approach is to match their length, and don’t be afraid to ask if you’re not sure how to estimate. If they do not have enough scope, go elsewhere. Safety is the prime concern. If you cannot go elsewhere, consider negotiating with them to add more scope for safety. Similarly, if someone comes in to the anchorage who anchors too close or does not use enough scope, it is fair for you to address them politely asking them to move or let out more rode. If they refuse and you feel uncomfortable with the situation, especially in questionable or deteriorating weather conditions, the best decision in favor of good seamanship is for you to pick up anchor and move. After all it’s your safety and that of your vessel’s that is in jeopardy. By the same token, if you get to an anchorage first and the anchorage starts to get crowded, don’t be a hog with 10:1 scope and actively try to help newcomers find a good spot rather than accusing them of infringing on your rights. Not only is it the right thing to do, it could save someone a night of distress  often you. Don’t forget that what goes around comes back around, and you may be the one in need next time. Whether you're the first to arrive or the last doesn't matter if you start to drag your anchor. Now yours is the burdened vessel in the eyes of the law and you must keep clear of all other boats. Everyone drags anchor at one time or another; it's how you handle the situation that makes the difference. If letting out more scope doesn't stop the dragging, the best thing to do is to move to a spot with a better bottom or to switch anchors to one that might work better for the given bottom type. Too many skippers delay the decision to move until they're bearing down onto other boats, and perhaps causing a chain reaction of dragging anchors that is very difficult to recover from. Maritime law is based on centuries of experience. It will go against you if you do not act according to traditional protocol and good seamanship. We all have stories of loud parties going well into the night keeping everyone else up, boats careening through a crowded anchorage, cell phones beeping endlessly or having to partake of someone else’s lengthy and loud conversation, listening to someone go on endlessly about some barber in Seville at high volume when you’d rather be in Margaritaville with Jimmy Buffet. How about just plain general and overall rudeness? In some cases, you know there is no amount of training that will overcome a particular boater’s rudeness and then it is best to move on. However, there is a collection of behaviors that come to the top of the list and that once appreciated can be avoided. We hope to help you avoid some of the pitfalls by sharing with you what we have learned, on occasion by making the mistakes ourselves. A giant raft up wisely took their party far from the main anchorage. Five things to remember that can affect anchoring etiquette: Sound, Smell, Wake, Lights, and Proximity. Please remember that sound travels far over water. Voices, music, engine noise, especially outboard motors, unmuffled go-fast boats, ski boats, jet skis, generators, barking dogs and the dreaded ‘ringing phone’ are all examples of the most egregious disruption of anchorage serenity. It is easy to see that common sense can prevail in predicting what will not be appreciated and protecting the serenity for the common good. That is not to say that you should not enjoy a good party. If you are planning a raft up or just an evening of revelry with friends, try to be the first in the anchorage. Remember, the first boat in sets the precedent, and that can apply to the use of the anchorage as well. People who see a raft up with expect some degree of rowdiness, although excess can be hard to tolerate for anyone. There are also certain anchorages where raft ups are common and people expect laughter, voices, music and BBQ scents to be wafting throughout. It can be easier to anchor in such a “designated party place” if you are planning a party where a certain set of behaviors is anticipated and often shared. Similarly, there is one particular anchorage where we know there is a slalom ski run set up so we know that if we anchor there, it’s our problem to bear if early morning skiers arrive. There is another anchorage where there is a wide open bay and ski boats make a point of coming as close as possible to anchored boats either as an annoyance factor or to show off. Believe me, we couldn’t care less how well you ski when our boat is careening in the wake after the sound of your passing made us jump out of bed to see what the ruckus was. Trust me, we’ll be cheering your every mistake and wishing you dramatic tumbles in vengeance, especially when our cat is cowering under the covers of our bed. There is also an interesting phenomenon that occurs when boats need to pass around anchored boats. One would think they might pass behind where there is no anchor rode to snag, but no, most often they pass in front. We keep waiting for some unsuspecting tourist in the anchorage to pull up our anchor by mistake. Then of course there is the proverbial bevy of mosquito-like jet skis that buzz around anchorages because they can. A friend once declared open season on jet skis that buzz anchored boats and I did not ask what that meant. But I did know what I wanted to do when it happened. Actually, we recently had a pleasant experience with jet skiers. They had a new version of muffled jet ski with 4-stroke engine and actually gave us a wide pass. It was not unpleasant; but don’t tell anyone. Yet, there is little worse, or more dangerous, than cooking breakfast below, hot coffee and tea in hand, and being thrown across the galley by a boat in a hurry. But noise comes in many shapes and sizes. A party of revelers who stay active well into the night can be as annoying as any jet ski; unless of course you are part of the party. So where is the happy medium? You can invite neighbors to the party, accept that people won’t be happy with you in the morning, or temper your volume along the way. Your choice. We’ve had experience with all three so you are not reading anything saintly here. Dinghies can often leave a bigger wake than larger vessels. Their engines can be loud, and the rider's voices can be heard far away, so don't make disparaging remarks about people's boats if you don;t want them to be heard. Let’s consider some other particularly annoying things that can happen in an anchorage. You wake up one morning hearing a little dog barking incessantly. It’s Sunday and he wants to go, but his master was partying last night and is sleeping in. You want to sleep in but there is not a visible sign of action onboard. Do you get in your dinghy and take the doggone dog out for a walk? They’d probably arrest you for dog napping but at least the dog would stop yapping and the anchorage would once again rest in peace. What to do? Calling on the VHF won’t do it because they are not listening. This is one of those things that may make you move on. We’ve actually stopped by the offending vessel in our dinghy under the pretense of finding out if the dog is in some kind of trouble. If you've got a generator, remember that noise carries great distances over water. Respect the fact that most cruisers appreciate tranquility. Many people do not realize that a generator can be very disturbing to fellow cruisers who do not have such mechanical gear on board. Sailors in small vessels have little aboard to generate noise. Anchoring a power vessel that has constant refrigeration or air conditioning that generates incessant noise of an engine and water running is inconsiderate. Try to anchor near other similar vessels that will not notice this type of disturbance to which you are accustomed. There is nothing wrong with letting people know that something they are doing is bothering you. We usually stand there and watch as new people enter an anchorage. If they come too close to our vessel, we will often either hail them on the radio or indicate to them from the deck where our anchor was dropped so they know not to park there. Similarly, if boats come through the anchorage creating a wake, we will ask them to slow down and point out their wake. Probably about half the time, especially in the case of inflatable dinghies returning from shore leave, they slow down having been unaware of the havoc behind them. Smell is another rather obnoxious way to interrupt someone’s idyllic evening. Barbecues light up in every anchorage and most people don’t mind the smell of burgers on the grill. But if you have an excessively smoky meal to cook or fish on the grill, being upwind of a boatload of vegetarians may be cause for strong sentiments. Sharing is not always a good thing, especially when you are upwind of other vessels and cooking something particularly odiferous. The proverbial nemesis of calm and quiet and getting away from it all is the cell phone. There was a story I remember hearing about a cell phone incident in an anchorage. A vessel was enjoying dusk in a quiet anchorage when the ringing of a cell phone broke right through the magic. The cell phone appeared to be on deck of a nearby boat, whose owners had gone ashore without it. After an endless number of rings, it stopped. Ah, silence. Moments later, it started again. This pattern was repeated for an eternity as the many friends maintaining close contact refused to give up on their friend’s unwillingness to answer. Then from a boat anchored nearby, a dinghy crossed surreptitiously to the offending vessel. Having watched the owners go ashore and having endured several hours of torture, they decided to take action before something or someone snapped. As the teller watched, with binoculars of course, the mysterious dinghy skipper, climbed onboard, removed the battery and returned both to the safety of the cockpit. Our hero. Any wake is a serious sleep deterrent at best and a hazard in the galley and elsewhere at worst. Just think of no wake as a zone where people are sleeping and do not want to be awoken. They also don’t want dishes flying off the saloon table, hot soup burning their hands, or bodies being flung against the rigging or off the boat. This is a serious offense in many anchorages, and remember that in many places, the harbormaster can pull you over and give you a citation that will cost you money. If you are determined to have been driving wrecklessly and endangering the safety of others, you can be charged up to $5000 in fines and serve jail time as well. So much for a joy ride! So in this case, a matter of etiquette can also be a matter of the law if the behavior crosses the line of common sense. 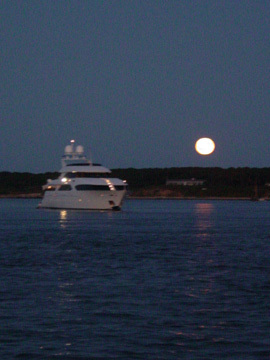 This magayacht had all the toys, the lights the music, a helicopter, and generators... and they thankfully stayed far away from everyone else in the anchorage at Edgartown. Light can be a major potential annoyance at best, and a serious hazard at worst. There are the boats lit up like Christmas trees with confusing configurations of lights that conflict with the anchor light required by law. Some people have their steaming lights, their deck lights, their underwater lights, and their landing lights on all at the same time creating light pollution in an otherwise secluded spot. All those lights require the generator to run all night long, which creates noise population to go right along with the lights. But as long as they stay far away, it’s not much of an issue. It’s when they start shining the lights on your boat that the problems begin. Most people looks for privacy when they anchor. 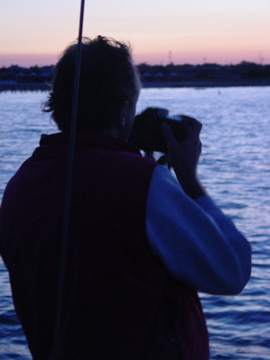 If you come into an anchorage at night and find that you must use a search light to find an opening, do not shine the light the directly at other people’s boats. Aside from disturbing their privacy and night vision, you may be lighting up more than you want to see. And never, never shine the light into people’s faces. You will blind them with the light, and if they are in motion as you are searching for the right spot, they will be incapable of maneuvering safely and may not see you coming after all. Be aware when anchoring (especially during the early evening hours), that almost everyone else in the anchorage will be observing you (as discreetly as possible, of course). It's just the way it is. You'll do it too. Just remember that it's not the anchoring, or the need to re-anchor, which separates the beginners from the experts - it's the amount of yelling and chaos that breaks out between the person handling the anchor, and the person maneuvering the boat. In order to avoid the embarrassing shouting you have all heard during anchoring and other maneuvers, we have several suggestions for communications that won’t start a Mars and Venus kind of discussion. Develop a set of hand signals to communicate with one another well in advance. When you have someone on the bow working the anchor (we prefer the strong male in that department even though we now have a windlass and we both have to know how to do it) and the other person is aft at the helm, it may be difficult to be heard above the roar of the engine. We will usually use simple hand signals to let each other know of obstructions, intentions and speed or course changes, but we also use walkie-talkies (handheld FRS radios) that are available relatively inexpensively at most sporting goods stores. These radios are especially useful when the wind is really blowing and your words are scattered from the bow before they have a chance to leave your tongue. We also use them to communicate from below decks to topside, like on night watch when we need to rouse a sleeping mate for a sail change or to communicate between the person on radar watch at the navigation station and the helmsman. The other great reasons to have these FRS radios are that you don’t need a license and they are legal for use on shore as well as keeping in touch with the dinghy brigade. Don’t forget, that VHF radio is for use solely on the water (and with special permit from land to water as in a marina dock-house). Don’t be too obvious with the binoculars, but recognize that they must be used at all times. How else will you know what they put down there, how much rode they let out, whether they have a snubber and what’s for dinner? Know in advance that there will be times when you and your target meet in binocular unison. Who looks away first and how you handle the intrusion will be most revealing to you about your own personality traits. And of course recognize that all eyes will be on you at some point in time. And if you have a pretty boat, expect the cameras too. There is nothing more disconcerting than an idyllic setting marred by boaters who inconsiderately and against the law, refused to use a holding tank and pumpout stations. Instead, they turned their heads overboard and turned the pristine envrionement into a cess pool. What a joyous thought to send your children swimming in proximity to such environmentally caring neighbors. NOT. That goes for any environmentally unfriendly refuse and discharge. Do not empty your bilge in small coves where small leaks causing oily discharge can harm the sanctuary. Do not feed the birds and do not throw anything overboard, including biodegradables, that would not have been there naturally to begin with. This is not only a matter of etiquette and good environmental practice, but in many places it is also against the law. Shore leave is a wonderful thing  it can be lots of fun, but getting back to your boat late at night, or worse yet in the fog, can be a little challenging. A common scenario is a shore party that had a lovely evening, toasted the season’s bounty in good company and is now having a jovial return to the mother ship. They are speeding through the anchorage, forgetting that dinghies often throw a bigger wake than their big sisters, they are shouting over the roar of the engine, having forgotten how far sound carries over the water, and they buzz boats everywhere, searching for the one they belong to and cannot find. Gone is the serenity of the anchorage in one ungracious moment. At night, it helps to have a flashlight. Etiquette in the anchorage, however, dictates that one should never shine the light directly into other people’s boats unless you are prepared to awaken someone very rudely or see something you really don’t want to. Common sense dictates respecting the privacy of your neighbors in the anchorage. If you are using your dinghy at night to go ashore or to visit others in the anchorage, consider doing so using oars and not your outboard. If you are rowing around the anchorage and see people on deck, you should be friendly but not intrusive unless encouraged, of course. Some boaters are friendly and like to socialize, while others are reflective and just want to be left alone. Tradition dictates that if you approach another vessel you should do so on the starboard side six to ten feet away. If you strike up a conversation and you recognize by their attitude that they really aren't interested, just move on. Similarly, if you approach a friend’s vessel and they are not on deck, approach from the starboard side and call out, “Ahoy, ‘vessels name’.” If they do not respond, move on. If they come on deck and respond, proceed as instructed. It is courteous to request permission to tie up and come aboard even if invited for a potluck dinner in advance. Never ever go knocking on the windows except in an emergency situation. Dinghy etiquette, therefore, dictates driving slowly without creating a wake, speaking softly to maintain the serenity, not shining lights directly into other vessels, and finding your boat with some degree of accuracy to disturb as few neighbors as possible. Even when being anchored, you are required to adhere to the USCG mandated rules of the road. The most significant to pertain to anchoring is staying away from restricted zones, never anchoring in marked channels, never tying up to government navigational marks like red or green buoys or lighthouses, and using the proper night lights and day shapes. In designated anchorages, you are not required to use the standard signals, but you may do so if you choose, and we always use an all around white light at night and black ball during the day. Although this is less a matter of etiquette and more a matter of adhering to law, etiquette is preserved when you adhere. You won’t be in the way of vessels navigating tight channels, you won’t be obstructing their view of markers or even dragging them off station, and you’ll be easier to see if you are well lit in aplace where there may not always be someone in the way.